The Second Volume, Water and Sanitation-Related Diseases and the Changing Environment: Challenges, Interventions, and Preventive Measures is now available. It is also a Wiley-Blackwell collaboration with Horizon International. 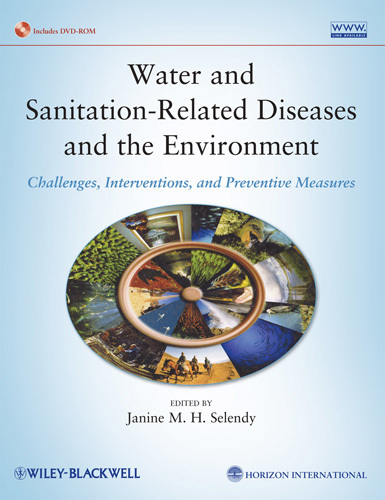 In her new title, Water and Sanitation Related Diseases and the Environment: Challenges, Interventions and Preventive Measures, Janine Selendy explores the close relationship between sanitation, clean water supply and the environment to outline strategies for the prevention and eradication of water and sanitation-related diseases. 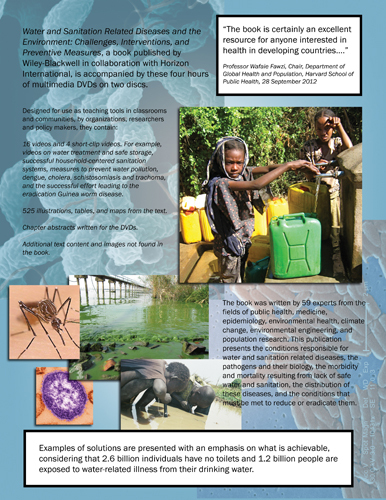 Written by 59 experts from the fields of public health, medicine, epidemiology, environmental health, climate change, environmental engineering, and population research, this authoritative volume provides an understanding of the interconnection among many factors linked to water related diseases, sanitation, and hygiene. It is brought together by Selendy who founded Horizon International, a non-profit organisation based at Yale University, in 1976. 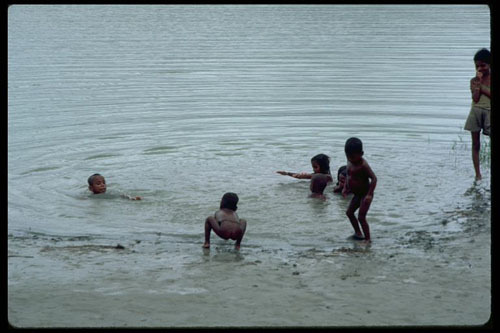 Children playing in pond in Bangladesh. Defecating in water is a frequent cause of disease transmission. : Shigellosis, the archetype of a disease resulting from poor personal and environmental hygiene and sanitation, causes an estimated more than 1,000,000 deaths a year. It was the second most common cause of diarrhea among U.S. military personnel during the recent Iraq war. From Michael L. Bennish and M. John Albert, “Shigellosis,” chapter in "Water and Sanitation Related Diseases and the Environment: Challenges, Interventions and Preventive Measures." This book presents the conditions responsible for water and sanitation related diseases, the pathogens and their biology, the morbidity and mortality resulting from lack of safe water and sanitation, the distribution of these diseases, and the conditions that must be met to reduce or eradicate them. “Meeting water and sanitation needs, coupled with protection of the environment and prevention of pollutants, is essential to every effort to improve the health and living conditions of billions of people,” said Selendy. The publication covers access to and the maintenance of clean water, and includes guidelines for the safe use of wastewater, excreta and greywater along with examples of solutions; this is presented with an emphasis on what is actually achievable in the real world, considering that 2.6 billion individuals have no toilets and 1.2 billion people are exposed to water-related illness from their drinking water. 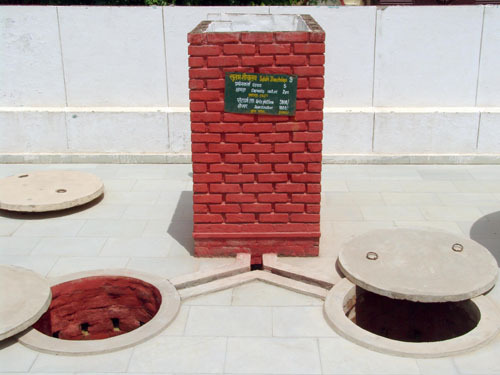 The Sulabh twin-pit, pour-flush, compost toilet - a simple solution to achieve the Millennium Development Goal on Sanitation: In India, the Sulabh Organization has built more than 1.2 million two-pit pour-flush toilets that are eco-friendly, technologically appropriate, socio-culturally acceptable, and affordable. Photograph courtesy of Dr. Bindeshwar Pathak, Sulabh International Service Organization. 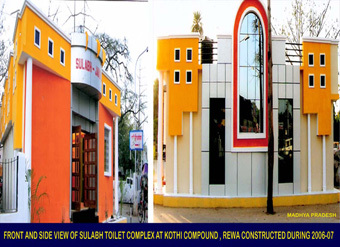 Sulabh Organization has built over 7,000 pay-for use public toilet complexes with bathrooms, lockers,: and private toilets that treat wastewater, and produce biogas for agriculture and horticulture. Combined these facilities serve more than 10 million people daily. Photograph courtesy of Dr. Bindeshwar Pathak, Sulabh International Service Organization. Preventive measures and innovative, successful solutions are presented throughout, as well as featured in more detail in a special section at the end of the book. This section highlights examples from a diversity of locations in both developed and developing countries, focusing on what has been achieved in the control of water related diseases—and what can be done if the multi-factorial approach in this book is followed. The accompanying DVDs, as well as a related websites, augment this vital information by means of case studies and articles, providing guidance for possible action on local and national as well as international levels. DVDs Descriptive flyer with book's Table of ContentsClick here to see the flyer about the DVDs content or click on image. The book’s DVDs were designed for use as teaching tools in classrooms and communities, by organizations, researchers and policy makers. They contain 16 videos and 4 short-clip videos. For example, videos on water treatment and safe storage, successful household-centered sanitation systems, measures to prevent water pollution, dengue, cholera, schistosomiasis and trachoma, and the successful effort leading to the eradication Guinea worm disease. They also contain 525 illustrations, tables, and maps from the text, chapter abstracts written specifically for the DVDs, and text content and images not found in the book. “The book is certainly an excellent resource for anyone interested in health in developing countries. Best wishes with the next steps on the supplementary material and all your efforts.” (Wafaie Fawzi, Richard Saltonstall Professor of Population Sciences, and Professor of Nutrition, Epidemiology, and Global Health, and Chair, Department of Global Health and Population, Harvard School of Public Health, 28 September 2012). Description: This comprehensive book advises treatment of conditions responsible for water and sanitation-related diseases. It details responsible pathogens and accompanying morbidity and mortality attending poor water supplies. Purpose: For reasons that somewhat escape explanation, many students of public health actually begin to embrace the discipline with enthusiasm through the water and sanitation course they are required to complete. This is absolutely the best book in terms of imparting this enthusiasm and technically explaining the delicate relationship that exists between peoples and their water sources. Audience: "It is hard to put limits on the applicability and importance of this book. Its editor believes it is an essential resource for graduate students and postdoctoral scholars as well as professionals. I'm going to add business and community leaders to the list. The book belongs on the bookshelf of every NGO or parent organization that hopes to improve lives around the globe." Features: Organized in eight sections, the book defines a global problem, connects water and sanitation-related diseases, examines available water resources, explains sanitation and hygiene, examines environmental factors, describes current and future trends in preventing pollution, highlights emerging issues, and offers a conclusions section outlining use of kinship structures. Included with the book are two DVDs that incorporate 16 full-length videos and various short clips, illustrations, and other materials. Assessment: Few books could claim a title as broad and embracing as this one. It posits a way forward for the cornerstone for global development. It is a primer for organizations as diverse as the World Bank, the United Nations, and the U.S. Agency for International Development. However sobering, it is worth any concerned person's time. Updates and additional resources are posted on a companion website: www.wiley.com/go/selendy/water and on the Horizon Solutions Site: www.solutionssite.org. The publication is available from many sources including directly from Wiley at: http://www.wiley.com/WileyCDA/WileyTitle/productCd-0470527854.html. Janine Selendy is Co-Chair, Founder, and Publisher of Horizon International, a non-profit organization based at Yale University, which addresses health, environment and disease issues worldwide. She also serves as principal editor and publisher of Horizon's web-based Solutions Site and oceans and coral reefs site. She is executive producer of more than 20 television documentaries, many of which have won awards including a Cine-Golden Engle and have been broadcast in many countries. This publication originated from a syllabus on water and sanitation she prepared at the invitation of Yale School of Public Health which was the basis of subsequent lectures she gave at both Yale and at the Columbia Mailman School of Public Health. She is a generalist whose early medical work included a discovery while doing cancer research and co-authoring a paper for the Journal of Diabetes. Her background in medical, scientific, environmental and other areas provides her with an appreciation of the interconnectedness of many subjects. The Carter Center has posted PDFs of four chapters from the book along with the Wiley flier for the book on its website at http://www.cartercenter.org/news/publications/health/experts.html.